Marrakech – A city of sounds, oscillating through the hot, dry, smoky air from the hoarse but incessant voice box of the Jemaa el Fna. Bewitching, enchanting, hypnotising. Of blaring pungi as the snake charmers lure their sluggish serpents into a trance. Of buzzing mopeds weaving through the heaving crowds, blindly beeping their horns at the frenzied flocks. Of the wizened henna ladies crying out for attention as they wildly wave their inked hands. Breathe it in. Feel intoxicated. Then turn and walk away. Keep walking, but not too far. For only a stone’s throw away from the mesmerising madness lies an oasis of calm. La Mamounia. The grand dame of Marrakech. Hidden in the city walls, standing proud against the backdrop of the Atlas Mountains, she awaits you. Whisper her name: “Ma…mou…nia”. Majestic, maternal, wise. She has seen a lot in her years, and has hosted many. Opened in 1923 as a hotel, the gardens were originally a wedding gift from the Sultan Sidi Mohamed Ben Abdellah to his son Prince Moulay Mamoun. Churchill stayed in the hotel on many an occasion from the mid-thirties through to his death, famously referring to it as “the most beautiful place in the world.” Today it is a symbol of refined luxury, a favourite among those wanting to be seduced, those seeking ultimate relaxation combined with an elegant ambience. La Mamounia boasts 135 rooms, 71 suites and three riads – one of which is home to the focus of our visit: Le Marocain restaurant. We arrive at the hotel entrance as the sun is setting a burnished purple. The sounds of the square have left the air, and a serene silence rests before us, the final melodic notes of the muezzin’s call to prayer just lingering in the warm breeze. From the moment we enter the gated grounds, there is a real sense that La Mamounia is there to nurture us, with our pleasure and seduction at the heart of her affairs. A pair of exquisitely dressed doormen greet us, and guide us with gloved hands in the direction of the restaurant. 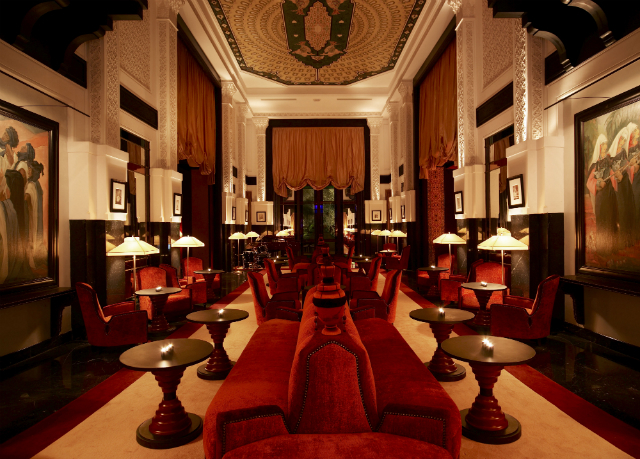 We pass through the beautifully adorned lobby, through gilded halls of arab-mauresque décor, a jazz trio accompanying us along the way. The heady scent of orange blossom hits us as we step down into the hotel’s 17-acred garden. In the shadows of the setting sun, we make out silhouettes of rows upon rows of olive and orange trees, lining the gravel paths before us. Palm trees tower tall, casting a protective eye over the grounds from up high, and softly glowing red and white Moroccan lanterns light our way as we wander through the abundant greenery. La Mamounia boasts four restaurants: Le Français, L’Italien (both of which are Michelin-starred), Le Pavillon de la Piscine (offering Mediterranean-style poolside buffets) and Le Marocain, specialising in Moroccan cuisine. Here, head chef Rachid Agourey, now in his 25th year at the hotel, has developed two menus – one that focuses on traditional dishes and the second that offers a more contemporary take on Moroccan tastes. 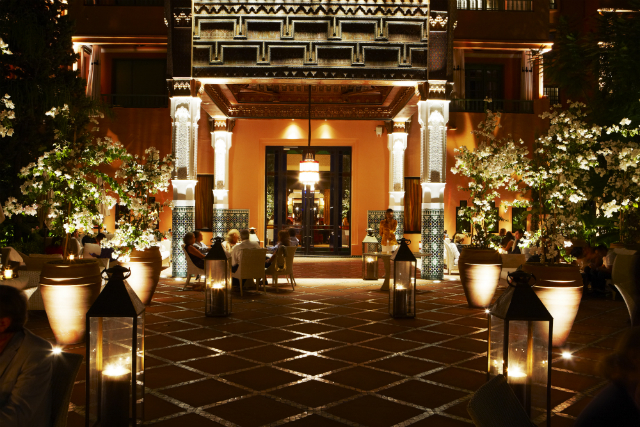 We’re seated in the sheltered courtyard area of the riad, where tables are positioned around a central lily pond. Candles flicker in lanterns, and an Andalusian trio plays hauntingly beautiful music in the background. We choose dishes from both menus, and begin with a traditional Moroccan salad. This popular dish comprises fourteen separate components, the sum of which is a visual delight when presented at table. Highlights are the confit tomatoes with sesame, a true sensorial pleasure, their natural sweetness overwhelming my mouth and nose. Thinly sliced carrots dressed in orange blossom water are texturally satisfying and provide a refreshing palate cleanser after some of the richer, oiler dishes. For mains, we’re recommended the saffron-scented monkfish and clams tagine, which comes with fennel fondue, potato and red olives. As a side, we take a vegetable couscous. Portions are pleasingly generous. The monkfish is perfectly cooked, firm to the touch, and offers up a mild sweetness that combines perfectly with the saffron flavouring. The couscous is a superb accompaniment to the fish, the soft grains studded with tender roasted vegetables. The waiter pairs the tagine with a white wine from Essaouira, Le Val d’Argan Blanc, which is round and silky and provides a great balance to the fish. We end our feast with a cinnamon scented orange salad, sprinkled with orange blossom water, followed by a tray of sweet, flaky French pastries served with fresh mint tea. We’re so full, so satisfied. But it’s hard to leave La Mamounia. She envelops you, makes you greedy, makes you yearn to be seduced further. We retreat to the Bar Italien for a digestif, and are entertained by the earlier jazz trio. The sumptuous red sofas hug us and ask us to stay – but it’s late; it is finally time to go. Heading through the gated drive, we make our way back towards the Jemaa el Fna. The sounds of the square return; they begin ringing in the air as we edge closer – the mopeds, the food stall owners, the juice sellers, the musicians. To think that such an oasis of calm can exist in this proximity is wondrous. I turn around to catch a final glimpse, and can just make her out against the very dark, starry sky. 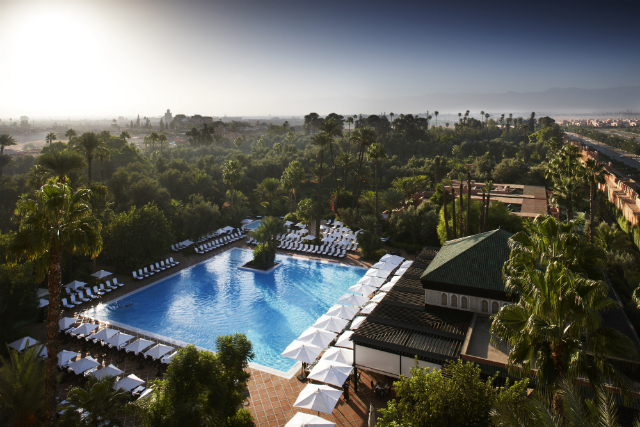 La Mamounia – the mirage. 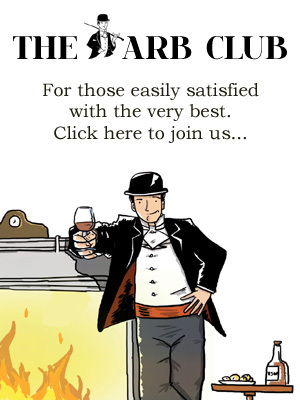 It’s no surprise Churchill came here time and time again – I’m sure that I too will be very easily lured back. Le Marocain at La Mamounia, Avenue Bab Jdid, 40 040 Marrakech. Tel: +212 524 388 600. Website.